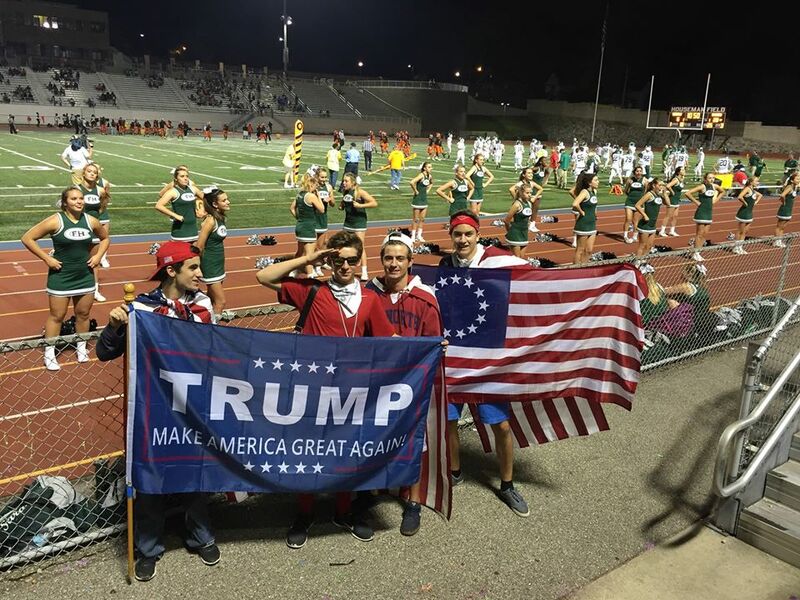 Students at a Sept. 9 high school football game created a controversy by waving a political sign and a historical American flag. Photo is from a Facebook post of Matthew Patulski. A Michigan public school superintendent wrote in a published “letter to the community” that students at a high school football game injected “hate” and “hostility” because they waved a historical Betsy Ross flag that has 13 stars to represent the original 13 colonies. The students waved the flag at a Sept. 9 football game at Houseman Field between Forest Hills Central and Ottawa Hills. The students also brought a Donald Trump for President banner to the event. The superintendent received a complaint from a parent and then published the letter which is dated Sept. 12. “And to wave a historical version of our flag, that to some symbolizes exclusion and hate, injects hostility and confusion to an event where no one intended to do so,” Forest Hills Public Schools Superintendent Daniel Behm wrote. Behm continued with an apology: "To our gracious hosts — the students, families, staff, and community of Grand Rapids Ottawa Hills High School and Grand Rapids Public Schools — and to the student-athletes, coaches, officials, and supporters of both teams, we are truly sorry. These actions are not characteristic of our schools, our staff, our students, or our community, and they represent a lack of knowledge." Ronald Hall, a professor at Michigan State University and an expert on racial relations, didn’t return an email seeking comment. Daniel Valentine, spokesman for the national NAACP, said he sent an email from Michigan Capitol Confidential to Yvonne White, who is the president of the Michigan State Conference of the NAACP. White didn’t respond. Your gift to Capitol Confidential supports investigative reporting in the public interest that includes a free-market point of view. Please consider a donation today to keep citizens informed about the challenges facing our state and nation.